Please print & distribute widely! 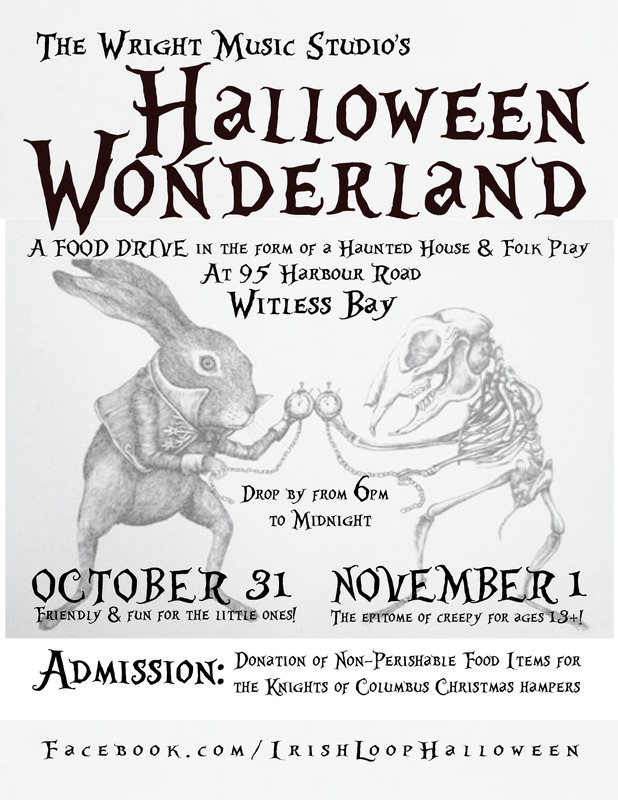 On Halloween, the Wright Music Studio (95 Harbour Road, Witless Bay) transforms itself into a haunted house to help support the Knights of Columbus’ Christmas Food Drive! The mission of our HALLOWEEN WONDERLAND: Bringing young people & community groups together to work for the common good, and encouraging our youth to trust in their creative potential & devote themselves to the service of the community. 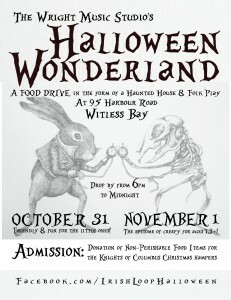 This year, our FOOD DRIVE is a two-day event, and will take the form of a folk play! The first evening (Halloween Night, Oct. 31st) will be friendly and fun, for kids of all ages. On the second evening (November 1st), our play will be as scary as we can make it – for high schoolers and adults only! The theme of our play is Time. I tell about story about having NOTHING to fear!